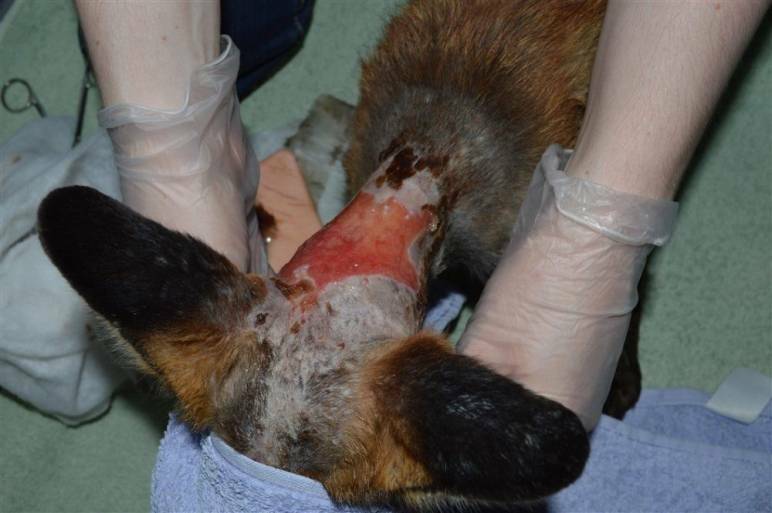 Snares are simply thin wire nooses set to trap animals which are seen as a pest or threat, usually foxes and rabbits. They are intended to catch animals around the neck like a lasso. The primitive design of a snare means it silently garrottes its victims, and leads to a slow, painful death. Even if the snare doesn’t kill the animal, it's probable they will die as a result of predation, from dehydration or by exposure to the elements. Snares are indiscriminate and will capture any animal that happens to step in to them. Defra reports that only a quarter of animals trapped in snares are actually foxes (the intended victims). The other animals most frequently caught are hares (33% of all captures), badgers (26%) and 14% described only as ‘other’. 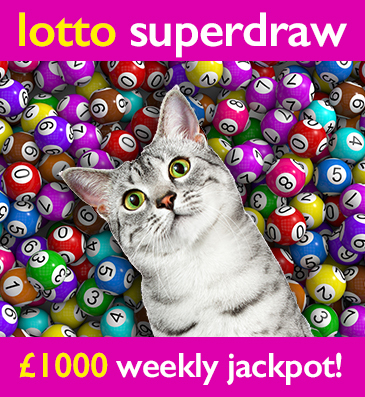 These 'other' animals include dogs, cats, deer, hedgehogs, pine martens, birds, and otters. 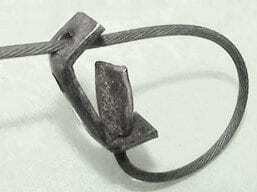 All snares are basically constructed of wire formed into a noose like shape. The most important thing to remember is that they are normally classed as either 'self-locking' or 'free-running'. Self -locking snares are illegal, whereas free-running snares are legal. 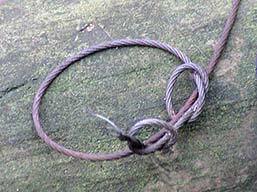 It is a major concern that free-running snares unfortunately can all too easily become self-locking. Self-locking snares are designed to continue to tighten as the animal struggles. This causes death by strangulation, a broken neck, or sometimes even decapitation. These snares should capture animals by the neck but very often do not. Animals get their legs caught, meaning the snare cuts down to the bone. These animals often try to gnaw off their own limbs in an attempt to escape. Other animals are caught around their bodies. 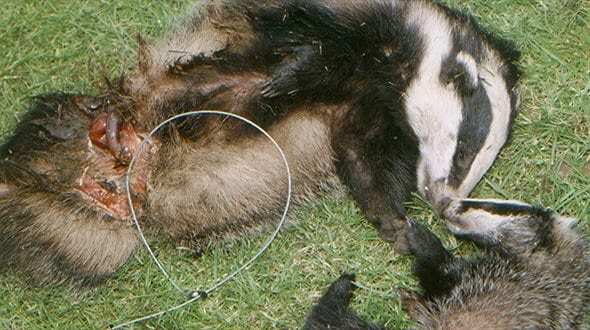 Badgers and foxes have been found in this way with snares tightened to around five centimetres in diameter. Some animals in this situation have been found still alive. Free running snares differ as they are meant to 'relax' or loosen when the animal stops struggling. 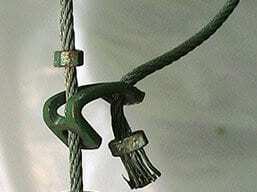 These devices often become self-locking if they are twisted, kinked, damaged, or rusty – all of which commonly occurs. As self-locking they then become not only lethal but also illegal. Dual purpose snares are also often used. These can be set as either self-locking or free-running. This is achieved by simply passing the wire through a different hole in the metal bracket which is then attached to a fence post/stake. If the wire goes through the top hole it creates a self-locking snare, if it goes through the middle hole it makes a free-running snare. 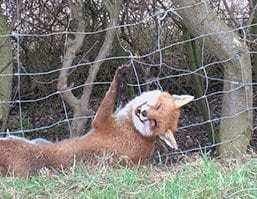 Snares, are mostly used on shooting estates, the aim of them being to kill foxes. The reason for this is to prevent the game birds bred, or imported on to the estate, from being preyed upon by the fox. It is intended instead that these birds will instead, be shot by paying customers. The indiscriminate nature of snares means that it is never going to be just foxes that are caught. Government figures estimated that around 1.7 million wild and domestic animals are trapped in snares every year – that equates to one animal every 20 seconds. Snares are most commonly used in July, August, and September, as this is when game birds for shooting are released in to open 'pens'. In some areas, on grouse moors for instance, snares are set throughout the whole year. It is interesting that groups associated with using snares, such as the British Field Sports Society and the Countryside Alliance, are often very open about the cruelty snares inflict. "Foxes wounded by shooting or snaring are likely to suffer prolonged pain and distress, even if the injuries are not fatal." "Even if the snares works perfectly, a fox could in theory be held struggling and partially strangled for almost 24 hours... When snared wild animals give every indication of profound fear ... In such a state snared animals can and do injure themselves, thrashing and terrified, in snares for hours on end." "Traps and snares are also non-selective. They can easily catch milking vixens, leaving the cubs to die of starvation, or as prey for other animals." There are alternatives to using snares which can be more effective, less time consuming once in place, and more cost effective. These include humane traps (which need to be checked at least twice a day), electric fences, wire netting and netting. Lights and reflective discs (like old CD's) can also be used to protect game birds. The UK is one of only five countries in Europe where the use of snares is still completely legal. The other countries are France, Belgium, Ireland and Latvia. The use of snares in Britain is regulated under the Wildlife and Countryside Act 1981, but it is simply impossible to enforce regulations for a practice that occurs primarily on private land and in remote locations. This Act states that it is an offence for a person - 'who sets a snare to fail to inspect that snare (or have someone else inspect it) at least once every day'. (Section 11(3)(b).) It is commonly known that following this law is not standard procedure, and the huge amounts of evidence is available to confirm this. To summarise this Act - the use of self-locking snares, the setting of any type of snare in places where they are likely to catch badgers, failure to inspect snares on a daily basis, and setting snares on land without permission, are all offences under the Wildlife and Countryside Act. 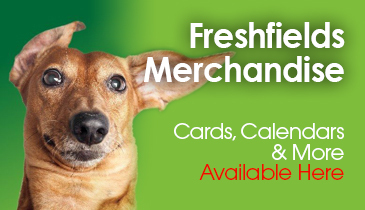 At Freshfields we have witnessed first-hand the misery and suffering snares cause. We have rescued and cared for fox cubs injured by snares and been alerted to vixens sadly killed by snares. Most shocking was the case of Kryss. She was caught around the neck by an illegal self-locking snare. If she hadn't been found when she was it is highly likely her agony would have been prolonged and she would have died. 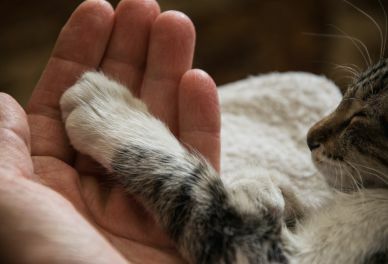 Her treatment was intensive but she did make a full recovery, and was released. We believe there should be a total ban on all snaring. To enforce this, snares of every type should also be illegal, including the purchase of snares made locally or imported from overseas. This is the only way to stop the horrific and unacceptable suffering inflicted on such huge numbers of animals. As evidenced above, we have seen for ourselves the unnecessary cruelty that snares cause. Severe injuries or death are unavoidable. We have helped rescue and treat animals affected by snares, but we are all too aware that there are many more who continue to suffer daily because there is no way of knowing where they are, therefore no help can be offered. Thousands more sentient beings from our diverse wildlife population continue to be trapped and tortured in these barbaric devises while they remain legal. To end this barbaric practice, we need your help. Many people already think that snares are illegal in this country, please help us by spreading the word and increasing public awareness. 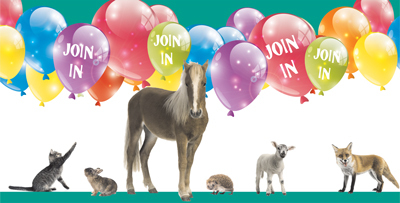 If you find an animal caught in a snare call the RSPCA immediately on 0300 1234 999. If you find a badger caught in a snare you should call the Badger Trust on 020 7228 6444. Ideally wait so you can show the officer exactly where the injured animal is. Although this will be difficult please do not try and release the animal yourself – you may cause even greater injury to the animal, and be hurt yourself. Officers may wish to collect evidence at the scene so you shouldn't interfere with anything. Be vigilant. If you see a snare while you are out you should make a note of its location and take a picture of it. Pass these details on to us so that we can make a record and share the information with interested parties. 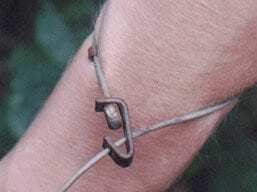 If you think the snare is an illegal self-locking one, and is set in such a place that pets or protected species could be harmed you should also contact the RSPCA. The following link lists wildlife crime police information throughout the UK.